The Manual is addressed first of all to students of BA and MA English and American studies as well as students of teacher training colleges who would like to develop and polish their writing skills in a systematic way. On the other hand, we hope that the Manual will be of interest also to academic teachers who teach general writing or academic writing and are looking for teaching materials matching the needs of second language learners of English. The Manual consists of three main chapters, in which the reader will find apart from a clear presentation of the material also plenty of practical activities with examples. The examples are authentic student papers. The first chapter focuses on the stages of the process of writing, the second introduces the commonly taught text types and the third presents the basics of academic writing. 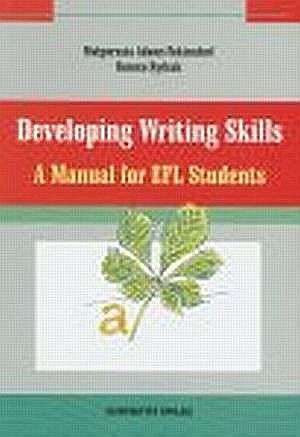 At the end of the Manual the authors included a detailed key to the activities and a short reference list that may be a source of information about the latest literature on the teaching of writing useful either for students writing their dissertations or for teachers interested in the topic. Nowość na rynku polskim. Podręcznik do nauki pisania w języku angielskim. Samouczek lub skrypt na kurs praktycznej nauki języka angielskiego. Dla studentów i nauczycieli - studiów anglistycznych i amerykanistycznych - kolegiów językowych - klas maturalnych. Atuty - autorzy znający potrzeby i słabości polskich studentów - usystematyzowany, kompleksowy materiał - duża liczba ćwiczeń praktycznych - autentyczne prace studentów jako ilustracje do zadań - szczegółowy klucz - cytowana najnowsza literatura.